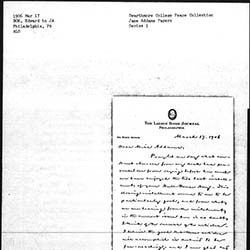 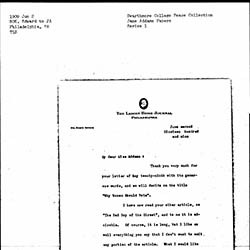 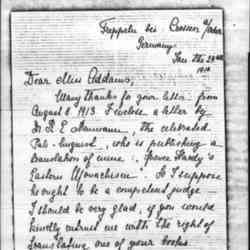 Nelson apologies to Addams for Macmillan Company's mistake regarding the distribution of her new book and promises to remedy the error. 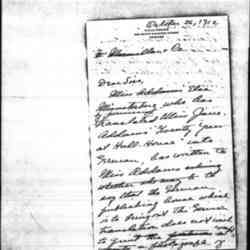 Hamilton writes Addams for instructions on how to critique her manuscript of A New Conscience and an Ancient Evil. 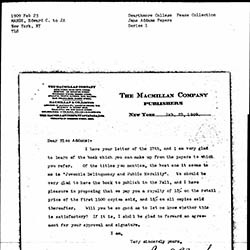 Norton promises to send Addams the table of contents that Hallowes sent and provides advice on locating a publisher. 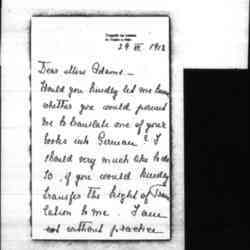 Finckenstein asks Addams for permission to translate one of her books into German. 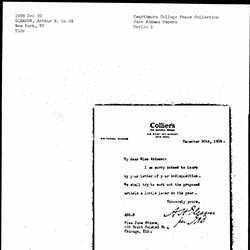 Arthur writes of his disappointment that Addams will not write an article for Colliers. 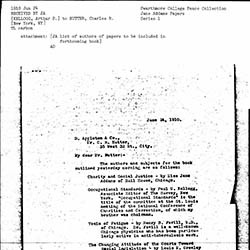 Kellogg sends a list of authors and subjects for a book and includes Addams' article "Charity and Social Justice." 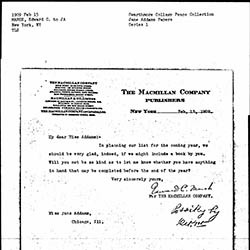 Kellogg appeals to Addams to publish Twenty Years At Hull House with the Charities Publishing Committee. 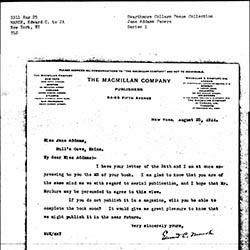 Mackenzie asks Addams for a meeting to discuss his idea for a new department at McClure Magazine to which she might contribute. 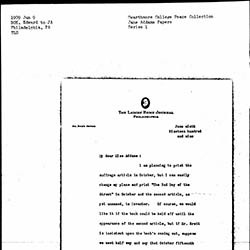 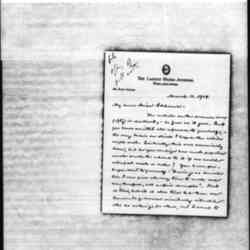 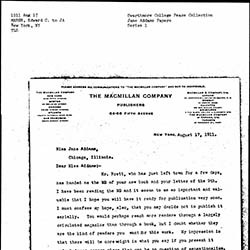 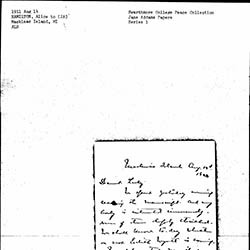 Nutter writes Addams about his disappointment that she will publish Twenty Years at Hull House with Macmillan instead of D. Appleton & Co.
Landsberg writes to Jane Addams' publisher about a German translation of Twenty Years at Hull-House. 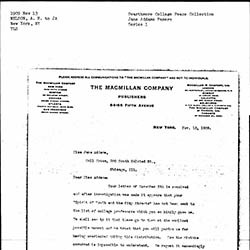 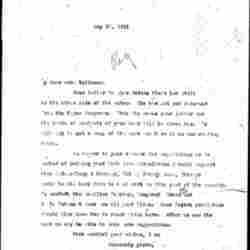 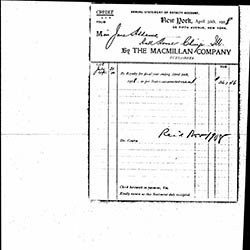 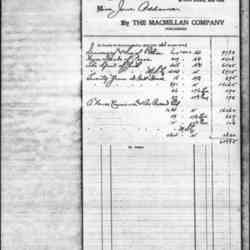 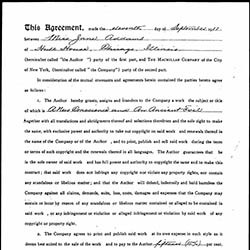 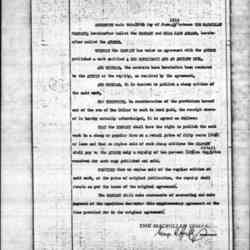 A contract between The Macmillan Company and Jane Addams for publishing inexpensive editions of "A New Conscience and an Ancient Evil." 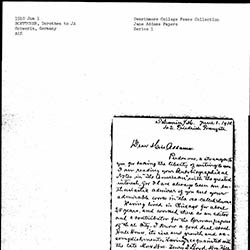 Waller asks Addams if she can use quotations and ideas from Twenty Years at Hull House for promoting social reform to the public in 1912. 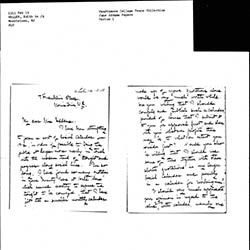 Bok congratulates Addams on her article "The Bad Boy of the Street" and tells her he wishes to publish it in two parts, but that it will require some editing. 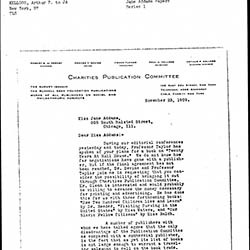 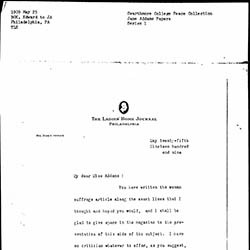 Bok discusses publishing schedules for Addams' articles in the Ladies' Home Journal in light of the publication plans for her book. 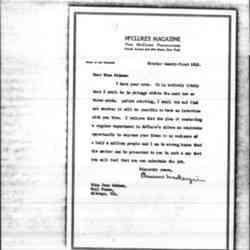 Bok congratulates Addams on her suffrage articles for the Ladies Home Journal. 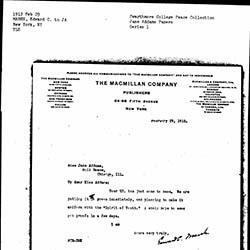 Marsh acknowledges receipt of the manuscript for her new book and cautions her against publishing it serially in a magazine. 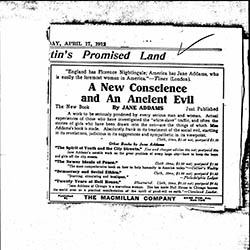 Marsh writes Addams about publishing A New Conscience and an Ancient Evil in serial format in McClure's Magazine. 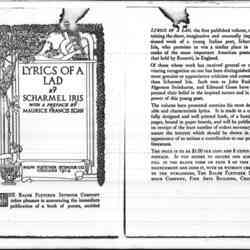 Marsh writes Addams about Macmillan Company publishing another book of hers. 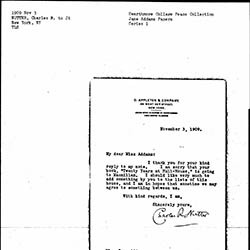 Marsh writes Addams that he prefers "Juvenile Delinquency and Public Morality" as the title for upcoming book. 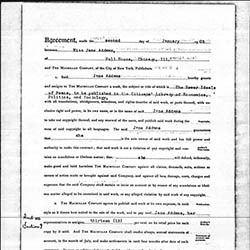 Marsh acknowledges receipt of Addams' manuscript for A New Conscience and an Ancient Evil.